Home > News > Emba > Is This The World’s Most Flexible Executive MBA Program? Is This The World’s Most Flexible Executive MBA Program? France’s NEOMA Business School has just launched a new Executive MBA program, leading the trend towards shorter, more flexible, and customizable business school courses. The school’s overhauled Global Executive MBA program, which kicks off in October 2018, will offer executive education experiences in three formats; a 15-month, on average four days per month, ‘intensive’ EMBA format; a 10-month, four-to-eight days per month, ‘accelerated’ format; and the innovative ‘express’ format, whereby participants can complete 90% of an Executive MBA degree from a triple-accredited business school in just seven months. The seven-month ‘express’ Global EMBA will see participants study full-time in July and August each year, before selecting one of seven partly online mini-specialization tracks over the next five months. The remaining 10% of the program is comprised of two (of four) International Learning Experiences (ILEs). All programs will be delivered entirely in English. The change, as Charles Waldman, academic director of MBA programs at NEOMA Business School, explains, has seen the school discontinue its full-time MBA program with a view to target both the MBA and the traditional EMBA markets with the revamped Global Executive MBA. “The market demands shorter and more flexible programs,” says Charles, who joined NEOMA Business School to head up the new Global EMBA program in September last year. “People don’t want to study for a period of two years during which their personal or professional circumstances can change. With the seven-month ‘express’ format in particular, Charles hopes to appeal to a younger and more internationally-diverse class, as candidates and corporates alike seek more flexible, executive-style courses. Already, there’s a lot of interest in the revamped program from diverse demographics which, he says, will only benefit the student experience on the course. “With so many startups and entrepreneurs around today, I don’t think age is the best criteria to decide whether someone is at a senior level or not,” Charles explains. 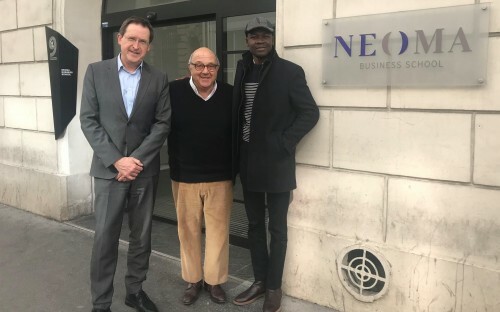 NEOMA Business School’s Global Executive MBA will be delivered primarily on the school’s executive campus in Paris, with some courses delivered in Rouen and Reims in northern France. Around 20% of the courses will be delivered online. 25% of the program will be dedicated to four International Learning Experiences (ILEs), with each experience comprising in-class lectures, company visits, and cultural immersions. Global EMBA students will explore innovation management and design thinking at Imperial College and the Royal College of Art in London; fintech at Baruch College, City University of New York; and entrepreneurship and business strategy in emerging markets in Accra, Ghana and Bangalore, India. “Personal development is in the DNA of our programs at NEOMA Business School,” Charles continues. “We want our students to move from being business managers to citizens of the world; sensitive and responsive to societal issues. What we do in Ghana and India is part of that. On the Global Executive MBA program, students will be able to personalize their learning to suit their career goals. A 12-day specialization will see students develop their own business plans or implement a project relevant to their real-life work. The school’s innovative spirit is marked by a host of new, or newly-refreshed, courses delivered both on-campus and online; elective courses like ‘Managing Diversity’; ‘Distribution Challenges in the Digital World’; and modules on artificial intelligence, blockchain, and big data. Traditional core courses in supply chain—with students experiencing the behind-the-scenes workings of a real factory—and marketing—where students put on virtual reality headsets and analyze the setup of a store reconstructed in 360° photos and videos—have been given a fresh face. NEOMA Business School is ranked among the top-50 business schools in Europe by the Financial Times. Over 80 nationalities are represented on campus, and the school boasts a network of over 55,000 alumni spread across 90 countries worldwide. What does Charles want from the school’s next generation of Global Executive MBA students? “To innovate and create value for their stakeholders, customers, staff, and for society,” he says.